Ever since the initial release of Stardog Spring support, I wanted to create a simple example application for people to learn how to use the Spring Beans and introduce semantic web technology using Stardog into traditional Spring technology stack implementations. So I'm happy to announce today a small sample application is now available on Github, the Stardog PetStore. Following the Spring PetClinic example, the Pet Store uses the metaphor of a store to go buy a pet - in this case, dogs! 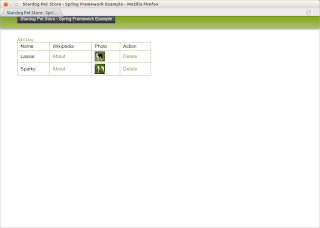 A basic Spring 3.1 Web MVC application, with one controller, and a couple views. There are, of course, lots of fun things going on with Spring 3.1 with Java configurations, javax.inject annotations, environment abstraction, etc. 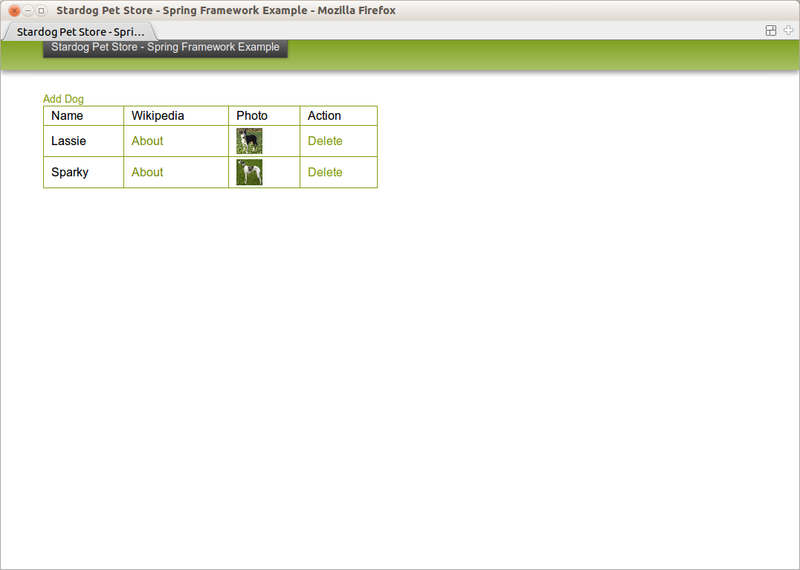 This sample was kept simple by following the standard 'Simple MVC Template' project available in SpringSource Toolsuite, so anyone learning Spring can follow the parallels of those samples. Also SnarlTemplate is analogous to JdbcTemplate, so it uses the traditional Data Access Object design pattern as opposed to new rich domain models and Spring Data. Like JdbcTemplate, this gives full control over the native APIs and lets the mappings manipulate or use as much of the underlying system as necessary. in our case, mapping to triples, naming our properties with URIs (i.e. RDF predicates) is a good reason to have this access. Using Stardog Empire support for RDF backed JPA and Spring Data JPA Repositories is certainly on the TODO list and a good evolutionary next step. Create a database called 'petstore', e.g. "stardog-admin create -n petstore"
Let's kick things off with the build. After checking out the project from Github, update the build.gradle file and set the location where the Stardog/lib folder exists. The next step is to run the gradle build. I recommend the recently released Gradle 1.0 and SpringSource Toolsuite 2.9.2, since it lets you specify the gradle folder directly. Command line builds with Gradle also work nicely. You'll see the Stardog Spring beans in the root application context, where we are connecting to Stardog via their SNARL protocol. The only requisite step here is to follow the Stardog documentation and create a database called 'petstore', i.e. "stardog-admin create -n petstore." The spring/appServlet/servlet-context.xml contains the standard Spring MVC related beans, and instructs Spring to component scan the com.example.stardog package. From here it will find the HomeController, DogDAO and wire them togeter with the corresponding SnarlTemplate and DataSource defined above. The DogDAO is where the interesting intersection with Stardog and Spring happens. Each of the usual persistence methods (list, get, add, update, remove) are backed by operations on the SnarlTemplate. The URL properties used for RDF creation are referenced in a Constants enum. In this case I reused pieces of the FOAF vocabulary - it's not hard to imagine a linked data query helping to fill out more releated information about the subject in question. Design note: As an aside, creating the DogDAO for pure domain object abstraction highlighted the need to enhance the SnarlTemplate with more of the equivalent methods like JdbcTemplate (e.g. queryForObject), and support Spring TX management. If everything works out correctly for you, you'll be able to browse and see a couple of entries listed on the web page. The list of dogs gets loaded from a dogs.n3 file, found in src/main/resources. very good infromation and thanks for sharing this keepitup. wow..it's very nice post..really i like this post..we are giving spring online training ..if any one want to learn plz once visit the link..
thank u for giving such a nice information..spring online training ..
very nice article.Thanks for sharing the post...! Hi, your article really nice. That is so logical and clearly explained. Keep it up! I will follow up your site for the future post. website development service in India, uk, usa, kanada, new zealand Etc. review, Webtrackker Technology, Webtrackker Technology, Webtrackker Technology, Webtrackker Technology, Webtrackker Technology, Webtrackker Technology, Webtrackker, Webtrackker Technology, Webtrackker Reviews. Really a good post, thanks for sharing .keep it up. Each department of CAD have specific programmes which, while completed could provide you with a recognisable qualification that could assist you get a job in anything design enterprise which you would really like.